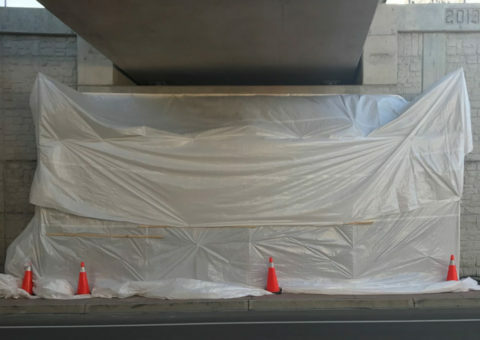 The project in the King Road underpass in Burlington Ont. 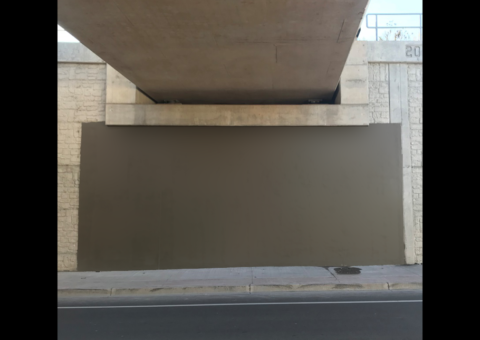 It’s a road underpass of Metrolinx’ Lakeshore West rail corridor and Indian Creek (i.e. an aqueduct). 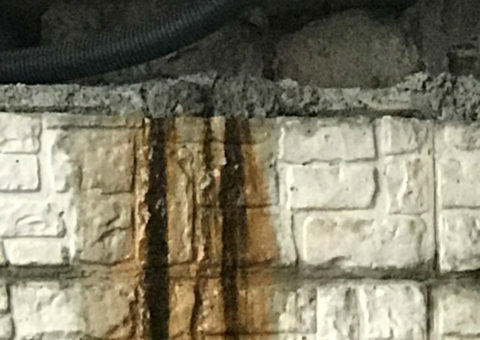 The leak is on the upstream (west) abutment wall, and seems to be the effect of having a high water table and a cold joint. 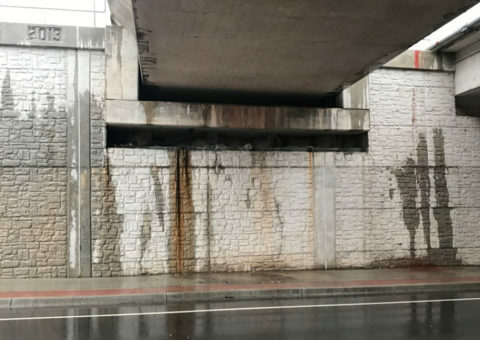 Water seepage on the underside of a railroad bridge abutment needed to be treated to preserve the structure’s integrity. A secondary bridge is also located at the site to allow for a creek below to flow freely. The primary bridge is used mostly by Canadian Pacific rail, so it was imperative that its strength was upheld to enable the safe crossing of freight trains. 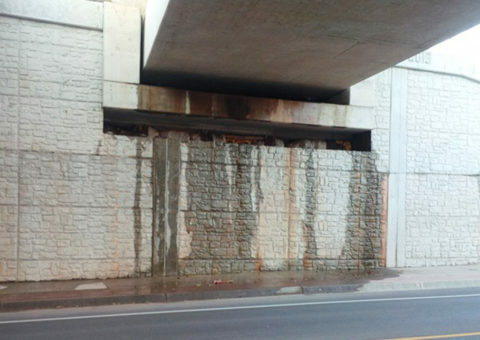 The problem is when the water freezes in the winter, the City of Burlington hires a crew to go to the bridge site periodically and remove the large chunks of ice that has adhered to the abutment walls so that when a thaw occurs, the chunks of ice do not fall on a pedestrian or vehicle. 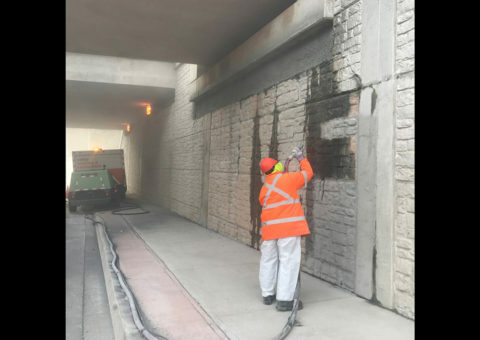 Kelso Coatings along with Hatch and the City of Burlington decided that the best way to permanently terminate the leaks is to first shotcrete the undersides of the abutments where the leakage is apparent. 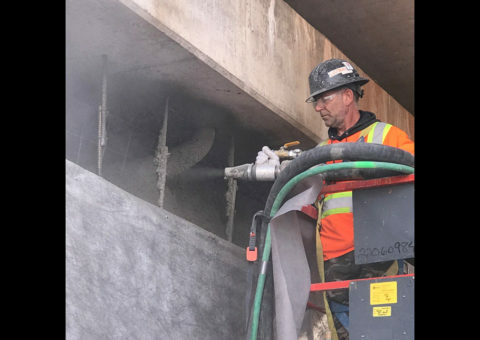 Once the shotcrete had cured, the CN2000 waterproofing system was installed to both sides of the bridge. 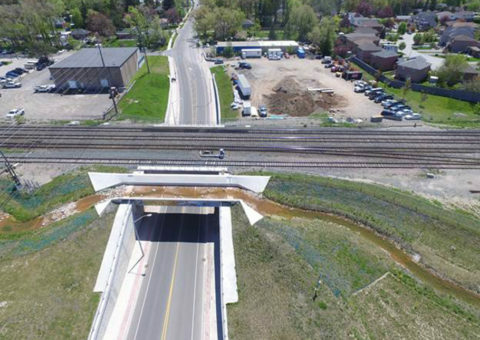 This solution successfully stopped all water seepage, extending the bridge’s life for the City of Burlington. 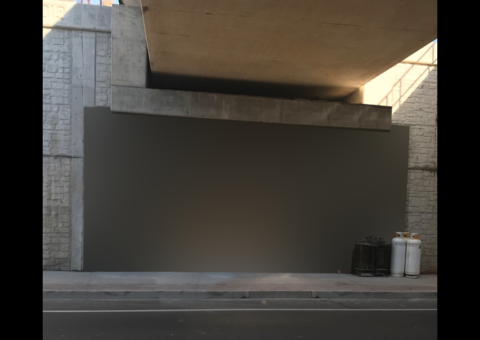 Additionally, the cost savings to the city is significant since the maintenance crews do not have to re-visit the site weekly in the winter season to remove the ice build up on the abutments of the bridge. Sand-blasted structures prior to application of CN2000 materials. Hoarding and heating was required to maintain temperature of concrete. 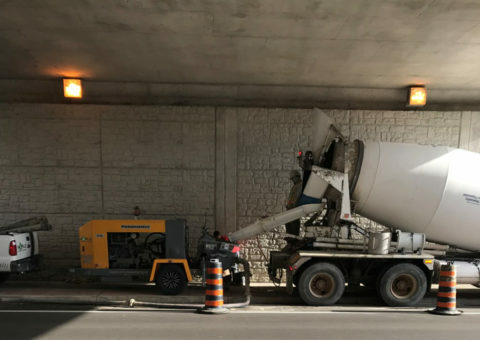 Dufferin supplied concrete for shotcrete phase. 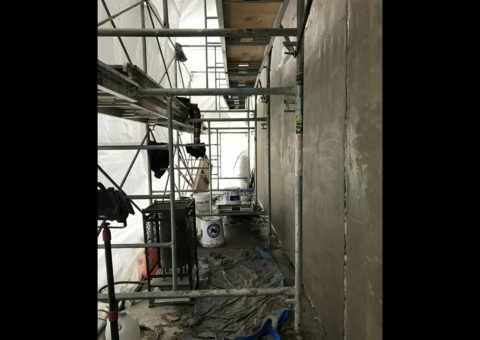 After shotcrete cured, CN2000 waterproofing system was used as a topical application. 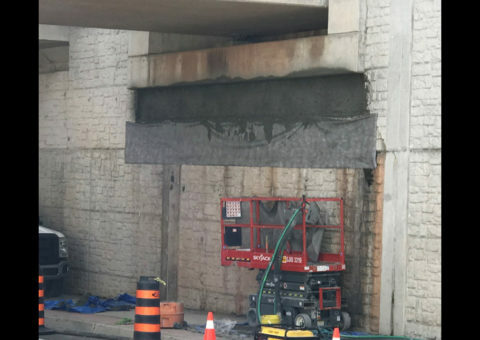 Wet mix air placed concrete (shotcrete) supplied by Dufferin and installed by CR Stop Leaks. Initial coat of CN2000B applied on entire surface including shotcrete. Identifiy active leaks and terminate the leaks using CN2000A insta-plug. After first coat of CN2000B has initially set but still green, apply second coat of CN2000B in a perpendicular direction of first coat. 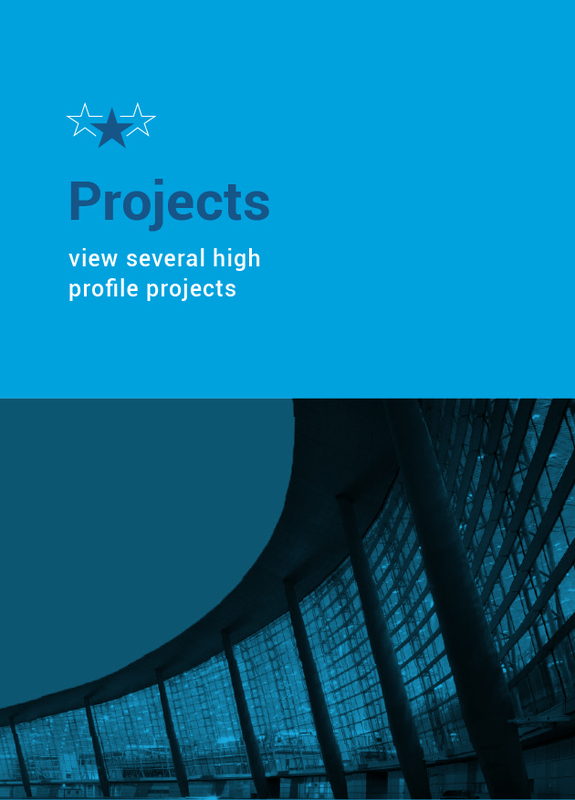 For curing purposes, roll on one coat of CN2000 C&D to keep the CN2000B crystalline coating hydrated for the 24 hour curing process.